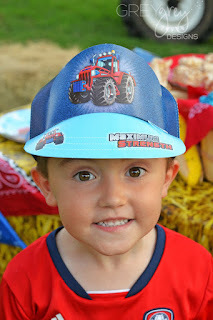 What little boy doesn't go through a tractor phase? I know my two have both had a time when they were in love with tractors. 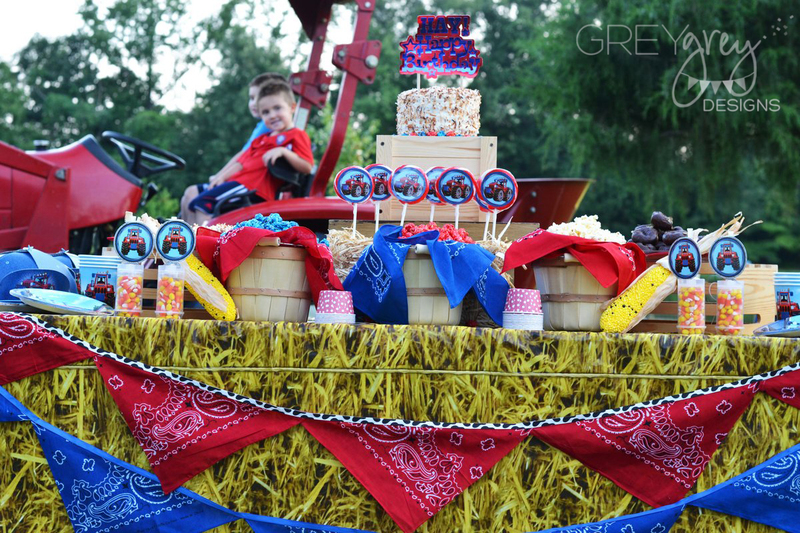 It's really a party theme that will never go out of style. Boys (and some girls) will always love tractors! I've done TWO tractor parties this year! 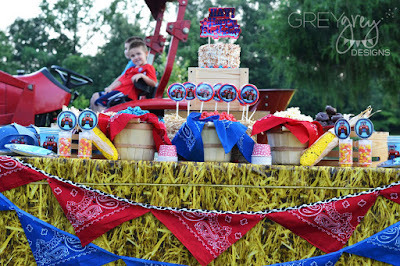 This party was styled for Birthday Express. 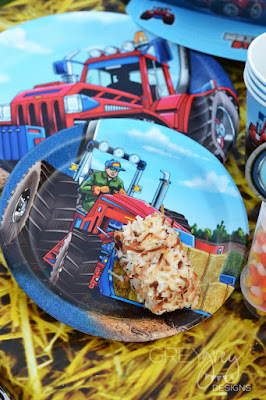 They just created this original tractor collection, and I love that it is a red tractor instead of the John Deere green. 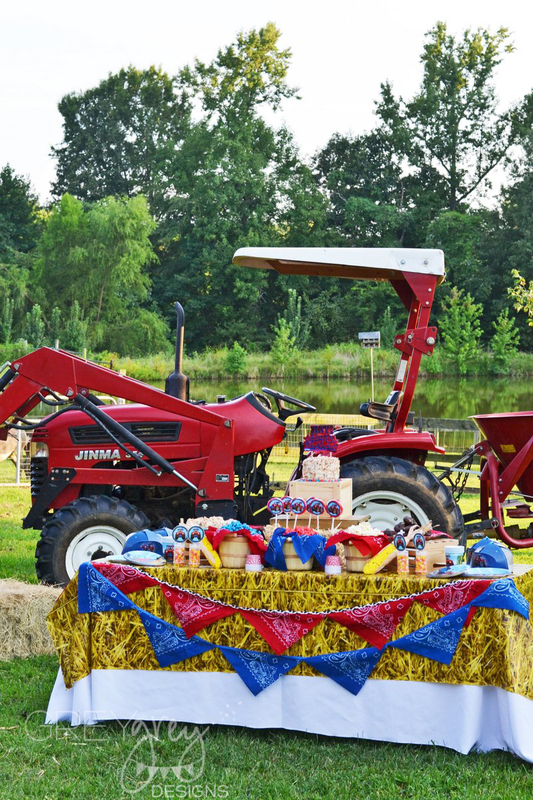 Some of our family friends have a beautiful farm outside the city and we love visiting them out there. 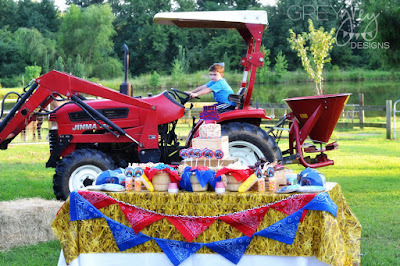 They just happen to have a giant red tractor that I was able to use at my party. My boys freaked OUT over it! 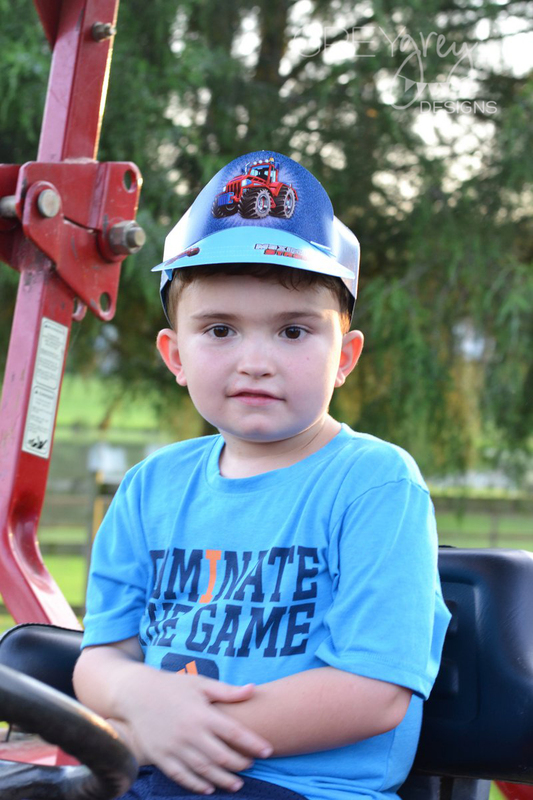 You can see them sitting on the tractor seat in this picture! Cute boys! 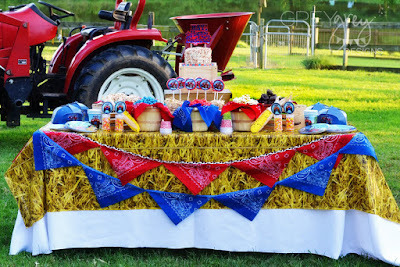 I started my birthday table with this cute hay printed tablecloth. I added it on top of a white floor-length linen. On the front, I made a cute bunting using handkerchiefs and ribbon. 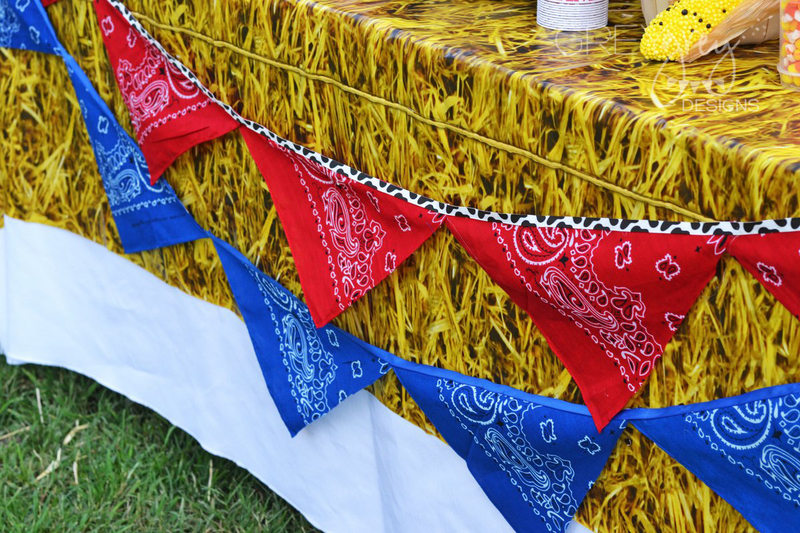 I hot glued the handkerchief triangles directly to the ribbon for an easy DIY project. 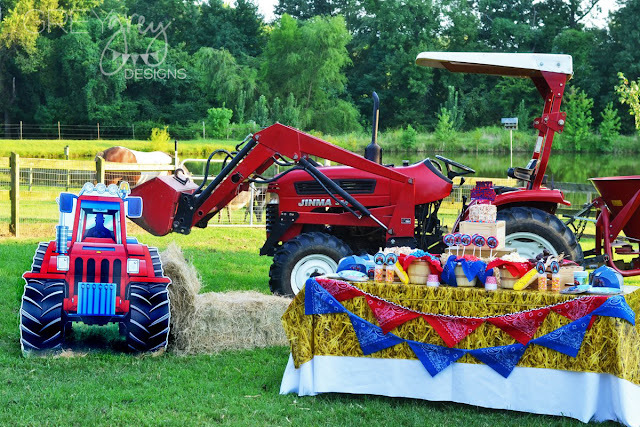 The beauty of this project is that you can use any color in the rainbow to match your tractor party! 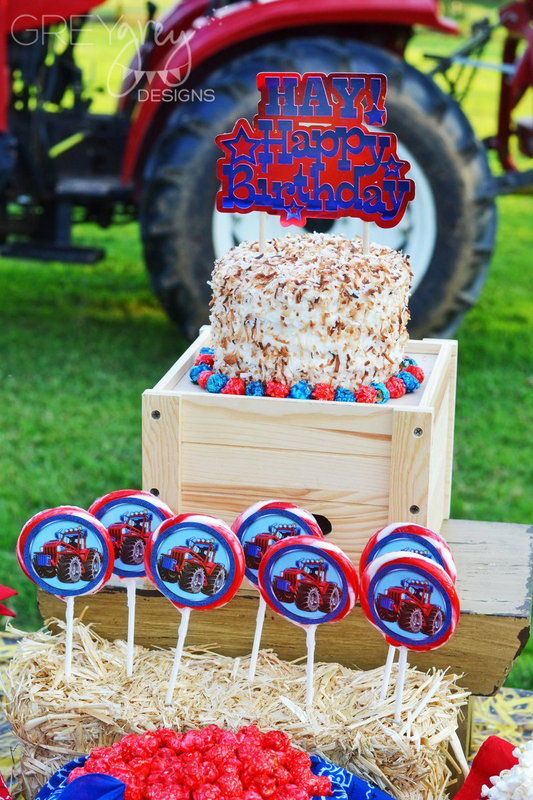 For the cake, I knew I wanted to do a cake covered in "hay!" 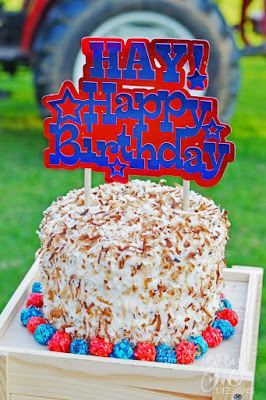 So, I toasted coconut and added it to this simple store-bought cake. 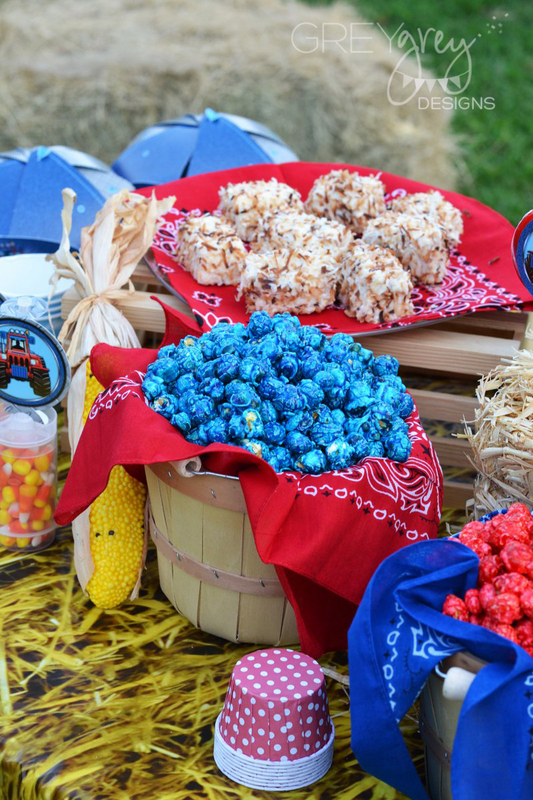 Then, I added some colored popcorn around the base. 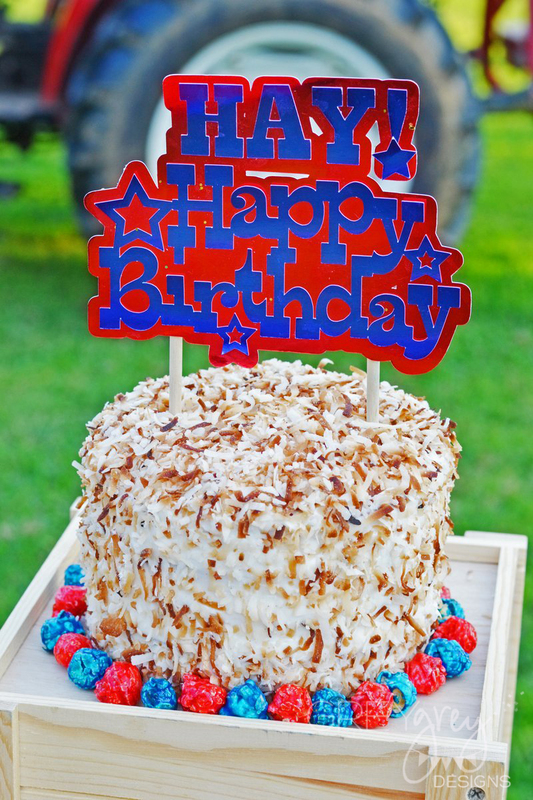 I cut the cake topper out on my Silhouette and used a metallic paper to make it shine. 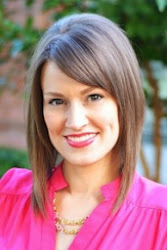 PS--I think the "Hay!" 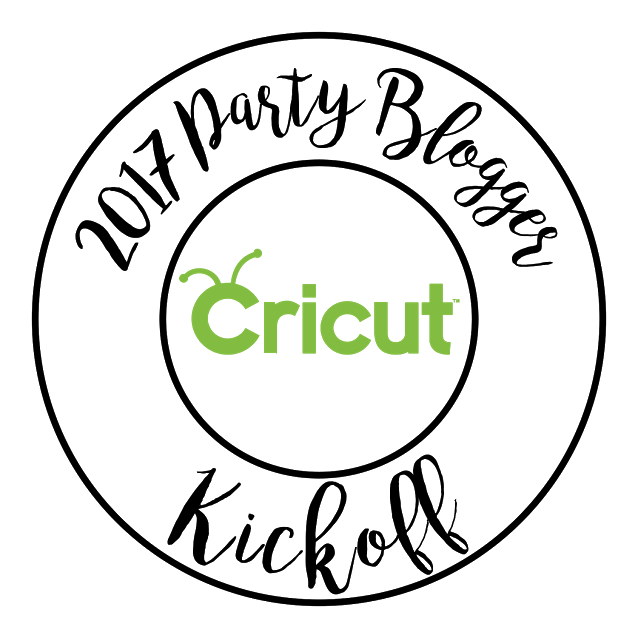 pun is pretty funny! I displayed it on a simple wooden box, turned on its top. I love the idea of every farm party having a popcorn bar! 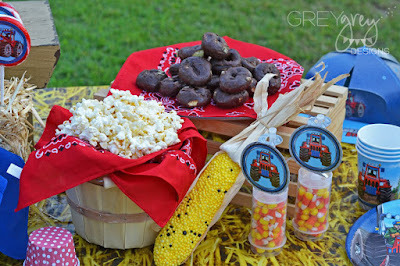 In this case, I used popcorn in the coordinating colors of the party! This candied popcorn is from Oh Nuts! I got cherry and blueberry and then popped some microwave popcorn for the third option. I displayed them in these apple baskets lined with colored handkerchiefs. 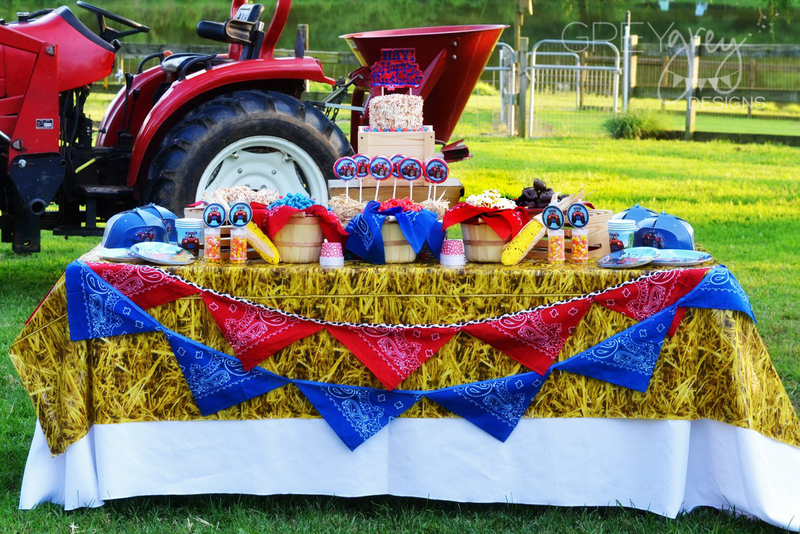 Another fun and easy treat for a farm party is "hay bales." 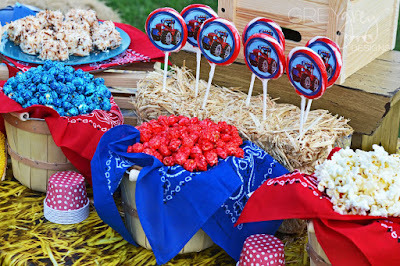 These are so easy to make and so cute! They are frozen pound cake that is dipped into white melting chocolate and then sprinkled with toasted coconut. 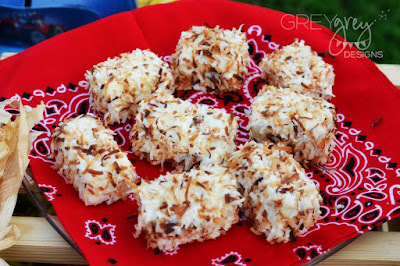 They are delicious too! 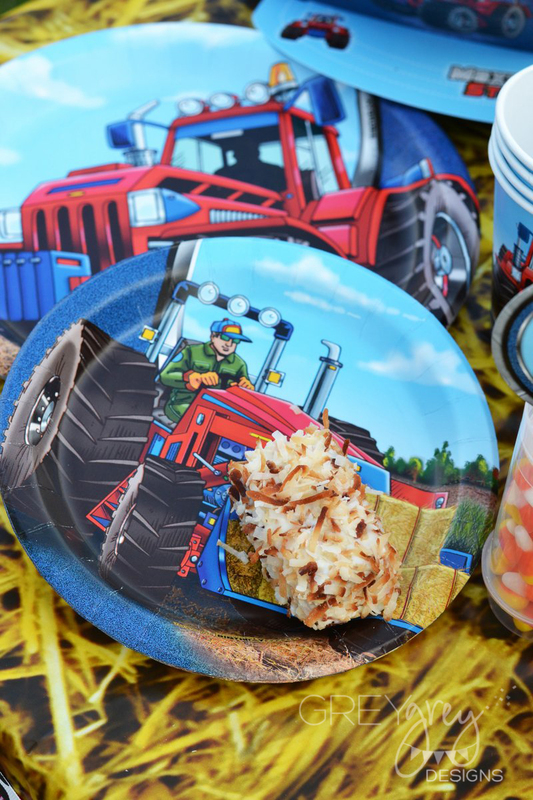 How cute do they look on these adorable tractor plates? 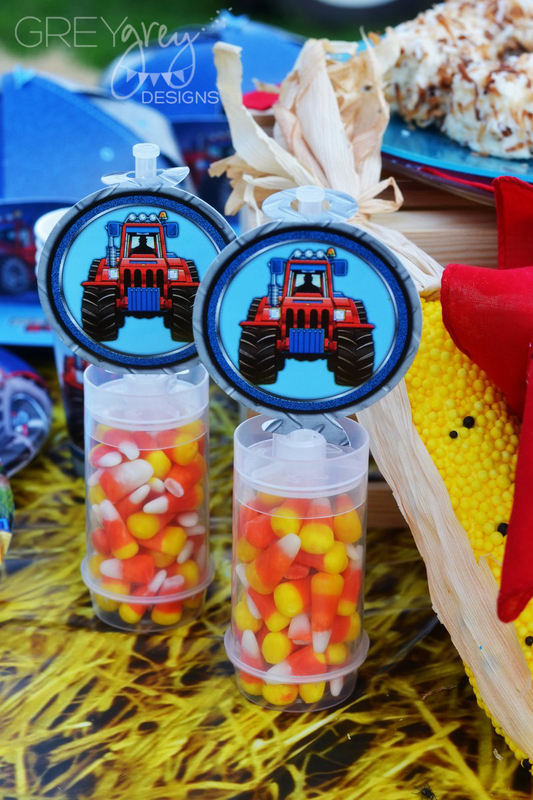 Continuing with the corn theme, I filled these push pops with candy corn and added a cute party blow-out to the top. Whirly pops are another favorite for kids and adults alike. 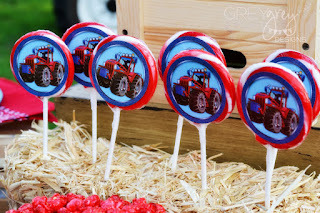 I used a red whirly pop and added a tractor sticker to the front. I displayed them in a miniature hay bale. 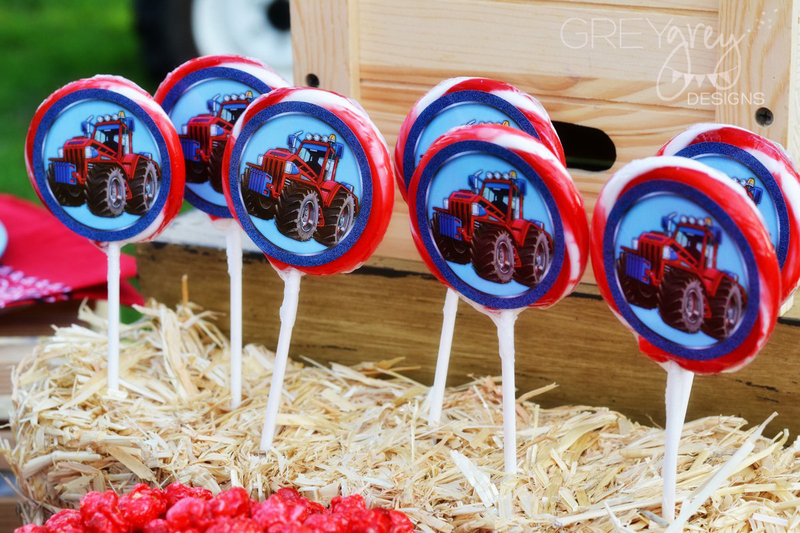 Tractor wheels anyone? 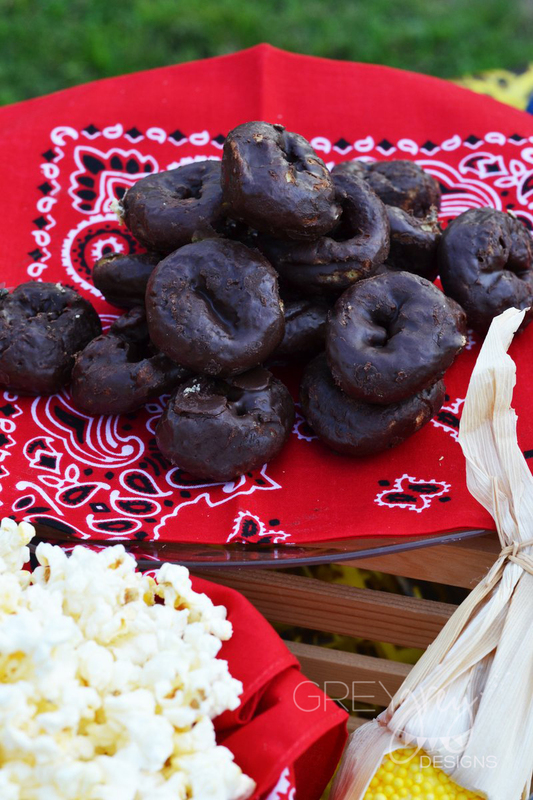 Chocolate donettes are the perfect "tire" for any vehicle themed party! My oldest guy LOVED riding that tractor! I said, "are you driving?" and he said "I'm steering!" Towards the end of our party I started to feel over heated and a person from event coordinator team was right there with some ginger ale to help me come around. The little things like that made such a difference.